This story was updated at 1:43 p.m. ET. China launched a massive Nigerian communications satellite Monday to link Africans with television programming, education services and navigation signals. Manufactured by the China Academy of Space Technology, the Nigcomsat 1R satellite will replace a craft that lost power and failed in November 2008, less than 18 months after its launch on a Chinese rocket. Nigcomsat Ltd., a company chartered by the Nigerian government, will operate the satellite for up to 15 years. Nigcomsat 1R "will provide optimal and cost effective voice, data, video, Internet and application services solutions," the satellite's operator said. Liftoff occurred at about 1641 GMT (11:41 a.m. EST) Monday, or just after midnight Beijing time on Tuesday. An 18-story Long March 3B rocket will streak into space from the Xichang launch base in Sichuan province in southwestern China. The three-stage rocket, boosted off the launch pad by four strap-on engines, will reach orbit 10 minutes into the mission. 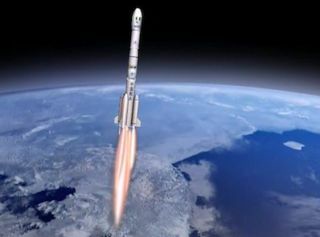 The rocket's hydrogen-fueled third stage will ignite a second time to place Nigcomsat 1R in an an oval-shaped transfer orbit with a low point of 124 miles, a high point of 26,092 miles and an inclination of 24.8 degrees, according to China Great Wall Industry Corp., the state-owned commercial sales firm for the Long March rocket family. Separation of the 11,243-pound satellite is scheduled less than 26 minutes after liftoff. Nigcomsat 1R will ultimately be positioned in geosynchronous orbit over the equator at 42.5 degrees east longitude. Artist's concept of the Nigcomsat 1R satellite. Nigcomsat 1R is based on China's DFH-4 spacecraft platform. China has reached agreements to build DFH-4 communications satellites for several non-traditional players in the space industry, including Pakistan, Nigeria, Venezuela, Laos and Bolivia. Nigeria ordered the replacement satellite from China in 2009 at "no extra cost to the Nigerian customer" after the failure of the first Nigcomsat spacecraft, according to China Great Wall Industry Corp.
Nigcomsat 1R's communications package includes 28 active transponders and seven antennas reaching across sub-Saharan Africa, Europe and Central Asia. The transponders will broadcast in C-band, Ku-band, Ka-band and L-band, according to Nigcomsat. China added several upgrades to Nigcomsat 1R to improve its performance over the preceding Nigcomsat 1 satellite. A Ku-band spot beam on Nigcomsat 1R will provide communications links between Nigeria and China, according to Nigcomsat's website. Nigcomsat 1R could stimulate economic growth in Africa, helping create jobs and saving customers expensive charges for telephone calls and broadband Internet access. The satellite's C-band payload will reach across Africa, while its Ku-band transponders will be aimed at regions of southwestern Africa and China. The Ka-band system will be wired into spot beams focused on Europe, Nigeria and South Africa, according to Nigcomsat. Nigcomsat 1R will transmit two L-band navigation channels make for more accurate satellite positioning services in Africa.